Designed with your business in mind, the SMCWUSB-N4 USB Adapter lets you access the Internet from your desktop or notebook PC to support your business needs. You’ll experience improved coverage above most WiFi networks with the latest USB 2.0 technology. Its compact and mini-design is ideal for use in the office, while traveling or in a wireless hotspot. Simply plug the adapter into your USB port and you’re ready to go. 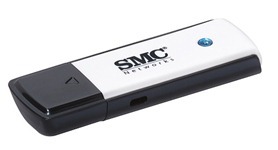 The SMCWUSB-N4 supports speeds up to 300 Mbps, six times faster than Wireless-G when the network is 100% Wireless-N. Speed means nothing if wireless data can be compromised. To protect data, the SMCWUSB-N4 supports Wi-Fi Protected Setup (WPS), 64- and 128-bit Wireless Equivalent Privacy (WEP), and Wi-Fi Protected Access 2 (WPA/WPA2/802) encryption. It also supports Wi-Fi Multimedia (WMM) for Quality of Service (QoS) and traffic prioritization over IEEE 802.11 networks — key benefits for applications that require QoS, such as Voice over IP on Wi-Fi phones. Complies with Windows 7/XP/Vista, MAC OS, etc. To learn more about this product, please download a PDF of the datasheet shown below.